Billy is an English artist focussing on creating unique, colourful and positive artwork. From digital illustrations to large outdoor wall murals, the adaptability of Billy's work ensures that her signature style can be seen across a range of media in all shapes and sizes. Taking influence and being inspired from traditional and contemporary African tribal culture, living in unfamiliar surroundings and keeping a positive perspective on life. 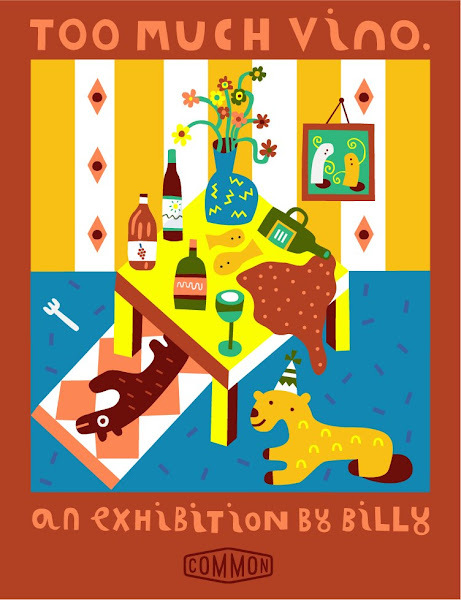 The distinctive shapes, colours, characters and symbols in Billy’s work are created with an intention to communicate a positive visual message and story and to make other people smile and be happy too. Billy’s work has been taken into galleries around the UK, Germany and Belgium and can be seen decorating the streets of London, Berlin, Madrid, South Africa and beyond. 'Too Much Vino' is a visual account from Billy beginning in her younger days on a river in South Africa, observing her parents and their friends get completely drunk and disorderly, right through to the present day where Billy resides in Berlin and enjoys a drop of wine herself. It is a documentation exploring how the development of a taste for wine, a love of colour and the search for happiness can work together in such harmony (or not, if you’ve drunk too much).